See that above? That’s roboticist Hiroshi Ishiguro. Well, one of them is Hiroshi, and the other one is his robot doppelganger. I think the robot is the one on the right, but I’m not sure. Either way, it’s spectacularly creepy, right? However, you might want one of your own. Millennium Retailing, parent company of Japanese department stores Sogo, Seibu, and Robinsons, have announced a special sale. 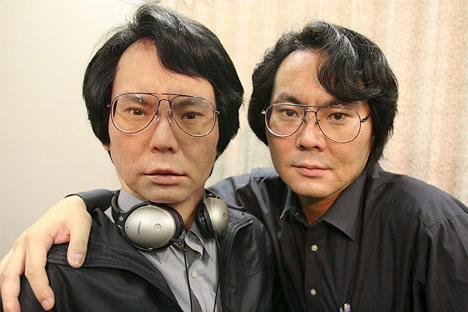 For the low price of $223,000, you too can have your own humanoid robot lookalike. The robots are based off of the Actroid, from Japanese robotics firm Kokoro, known for robot receptionists throughout Japan. These personalized robots will look like, sound like, make expressions like, and will even move like their owners. It’s like Surrogates, but in real life. The catch is Kokoro is only going to make two of them. Thank goodness; I couldn’t bear to see a bunch of those super-creepy robots wandering around, being disturbing.